Vessel Chem Helen, rescued two fisherman who were floating in the water, off the coast of Belawan on 1st December’17. The two fisherman, later identified as Mr. Maswan and Mr. Rajoli from Belawan, were hit by a large wave a few days back which damaged and tore apart their small fishing boat. Unfortunately they reportedly lost their other two comrades to the sea, before the vessel Chem Helen found the two floating survivors. The rescued fishermen were brought to safety onboard and were given immediate first aid to their wounds. After coordinating with the MRCC, they were handed over to the Indonesian Coast Guard, the next day. The one and half hour rescue operation was well executed by Captain Mario Fernandes and the crew from Chem Helen. The crew was commended for its efforts by Flag State representative, Mr. Al Romero, (on behalf of Deputy Commissioner of Maritime Affairs), Republic Of Liberia, “We commend the officers and crew of the CHEM HELEN for the humanitarian effort in retrieving the shipwrecked fishermen”. We congratulate the crew on their alert watch keeping and exemplary coordination in executing the rescue operation and is testimony of the high standards maintained by ESM. What would have been a routine sail for Atlantic Leo (managed by ESM), turned into a high sea rescue mission after the 47128 DWT Chemical Tanker and her crew were called upon to rescue international refugees in their sinking lifeboats. Atlantic Leo received a distress call from the Maritime Rescue Coordination Center (MRCC) Rome, shortly after the vessel departed from the Port of Zawia, Libya on 16 April 2017. Capt. Amit Sharma, was informed of a boat in distress 20 nautical miles away from where their current position. Immediate assistance was required for a search and rescue operation at a point between Malta and Libya to aid a multitude of people onboard a sinking rubber boat, who were trying to escape to Italy from Libya. After their arrival at the location two hours later, the crew spotted around 80 immigrants crammed on a rubber boat with a few swimming in the water as well. Together with the Italian Coast Guard, Atlantic Leo carried out the rescue operation swiftly. 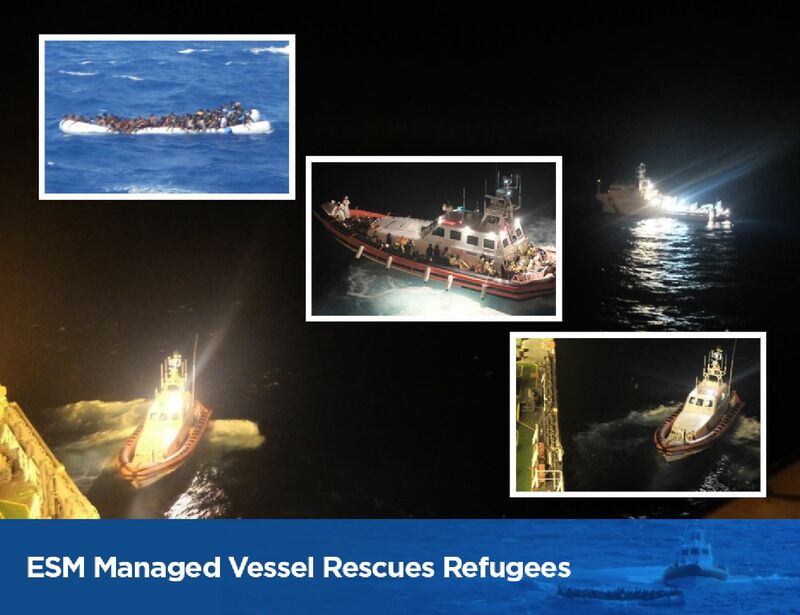 All 80 immigrants were successfully transferred onboard the Italian Coast Guard boat within an hour and a half. Another three hours were required to transfer into a larger boat that was heading towards a refugee camp. Atlantic Leo escorted and assisted the Coast Guard all along the process and were on constant vigil to ensure none of the immigrants were left behind. 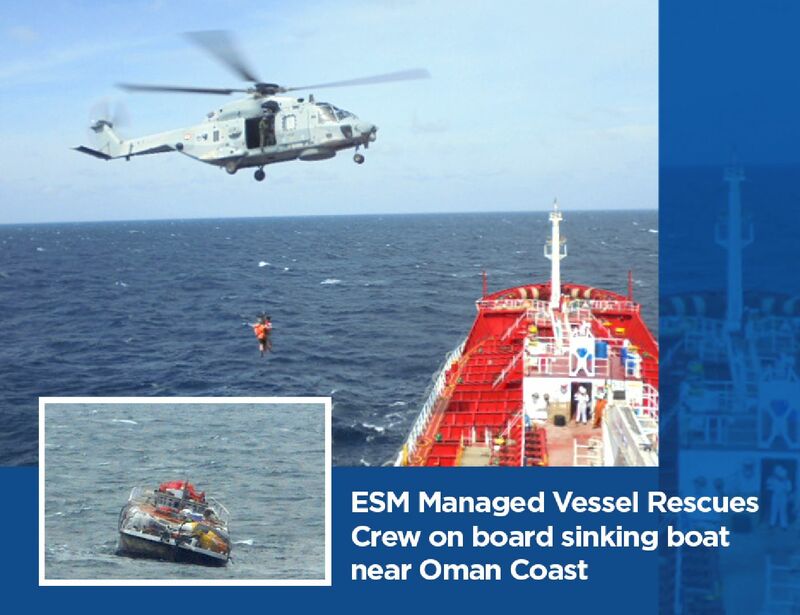 ESM Managed Vessel GSW Adventure rescued 12 crew members of Fishing boat, Al-Shena, on 13th February’17, off the Oman Coast. All rescued crew members are reported in good health and safe. Our Vessel GSW Adventure received a distress call from the Fishing Boat which was in danger of sinking with 12 crew on board. With the assistance from the French Coalition Warship and its rescue helicopter, crew members were airlifted and safely transferred to our vessel, subsequent to which the Al-Shena sank. Our vessel GSW Adventure is currently enroute to Mina Saqr for disembarking the survivors prior to resuming her voyage back to Shuaiba.